I know, right? I get to look at that sweet smiling face every day! Hi friends! I wanted to drop in and fill y'all in on what we've been up to lately. I have felt a tad bit disconnected with the blog world since Mr. H was born, but I think I'm starting to see the light at the end of the blog-less tunnel. 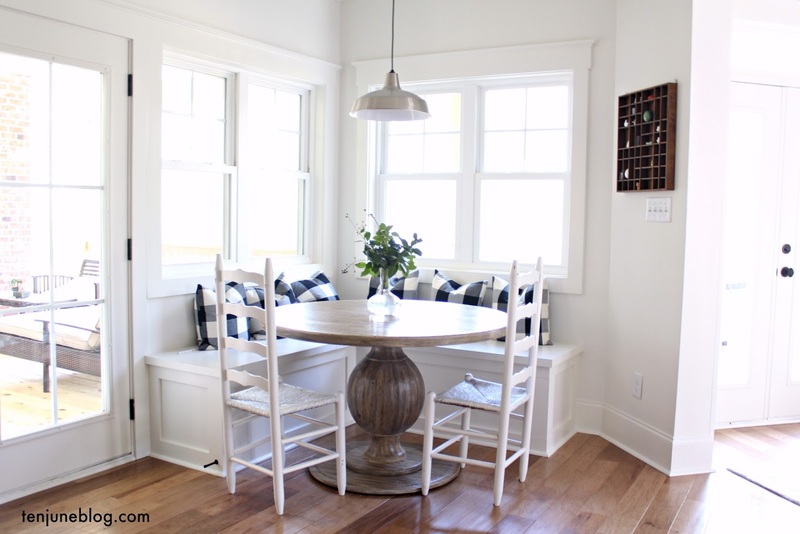 First off, I'm so glad you guys have been digging the rerun series of my favorite DIY posts. Those posts have made it a lot easier for me to keep up with blogging while leaving plenty of time for me to love on my sweet baby every day, so thank you for the support! So if I haven't been doing a lot of live blogging, what have I been up to? For starters, raising this cute bundle of joy. 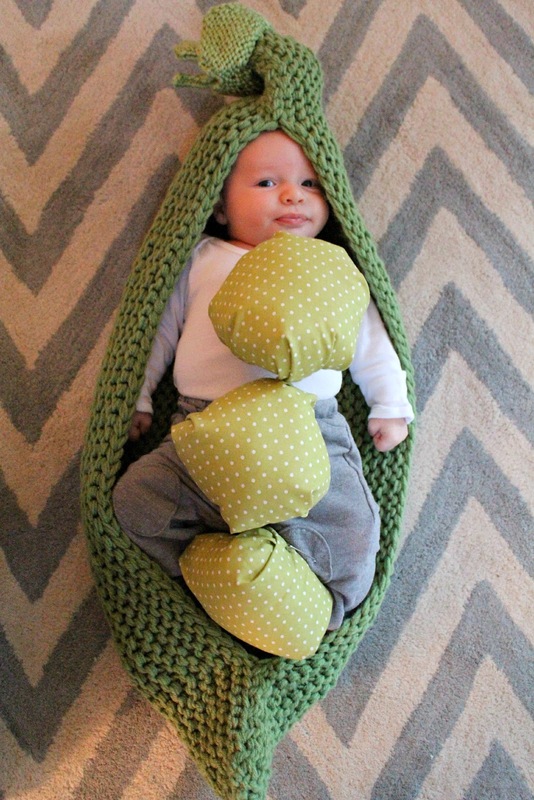 Yup, my pea pod dressed as a pea pod for his first Halloween! Pretty cute, right? One of my closest friends, Courtney, bought the knitted costume from Etsy and I added the fabric peas. David and I had so much fun toting baby H around to our neighbors' houses and holding him while we passed out candy to trick-or-treaters. He was such a good sport! Also in the name of all things fall, we visited H's first pumpkin patch. We took a cutie patootie family photo and also tried to get H in his own shot. Not exactly successful (he looks so uncomfortable!) but still cute. Any baby in overalls is beyond precious. Over the last few weeks, we've been really blessed to have had a lot of visitors. My mom has spent a lot of time with us, which is so much fun. She's even spent the night a few times while David has been out of town for business, which was awesome. There's nothing like having your mom to help you out! We were also visited by two of my college buddies- Courtney and Megan. They each came for a few days and quickly reminded me how much I miss my sweet friends! They need to move closer, that's for sure (Courtney lives in Manhattan and Megan in Kentucky). While Megan was here, we took baby H for a hike in north Georgia. David and I took him on his first hike while we were in Hiawassee for my birthday, but this was his first hike on momma's chest. I carried him in the Baby Bjorn, which he loved. He looked around for about half the time and slept for the other half! Such a perfect little angel. For those of you paying extra attention, yes... this is the spot where David proposed to me almost six years ago! It's on the trail of one of our favorite hikes. PS. Please pretend like I don't look sweaty/exhausted/running on three hours of sleep/hadn't just climbed a mountain. Not my best photo opp. Love that picture. My baby is so gangster. 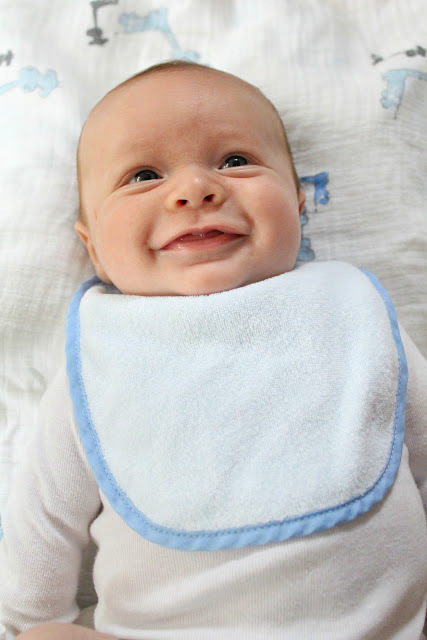 Last week, H had his two month doctor's appointment. He weighed in at a whopping 12 lbs, 3 oz., which is almost double his 7 lb. 2 oz. birth weight! Someone likes to eat, that's for sure. He checked out healthy all over, which made David and I so happy and proud. He also got a round of vaccines... and was such a trooper getting them! He cried for a split second (hey, I do too with shots!) and then acted like nothing was wrong. Ain't nothing but a G thing, baby. HDawg is really doing so well at home. He's started sleeping more and more each night... so far, our record is 6.5 hours in a row, which thrills me! At the beginning of his life, we were waking him up to feed him every few hours (per our ped's recommendation), so going seven hours between feedings is incredible. He's such a champ. And sleeping more has really made him so happy! Every day, he becomes more interactive and social with us. He's smiling, oohing and ahhhing, laughing and shaking his rattle (he loves the baby car keys, just like his daddy!). His absolute favorite toy is the play gym- he loves watching the flashing lights while he lays back and kicks his legs. That boy is gonna be a soccer player (especially if David has anything to do with it!). In non-ridiculously cute baby news, David and I put our house back on the market. We've had a few showings so far that have been quasi-successful (I say quasi because they loved our home and kept us on their short list, but ultimately decided to purchase another home). So I guess successful is not the word... I'm just trying to keep a positive spin on all of this. It's hard not to get our hopes up that the house will sell quickly this time around (if you want to catch up on our house selling saga, read here), but we're trying to be patient and trust in the big man upstairs to lead us in the right direction. We truly appreciate any prayers, love and support for us to sell! And if you know of anyone looking to buy north of Atlanta, please send them my way! I think that's most of what we've been up to lately. I still have a few weeks before I go back to work (I plan to go back part-time at first), so I'm hoping to get back in the project + blogging swing soon. Although who knows... I might just stay in this baby bubble for a little while longer : ) I'll come up for air sometime soon, I promise! But did you see those chunky legs? Talk about a cute distraction, so who can blame me?! 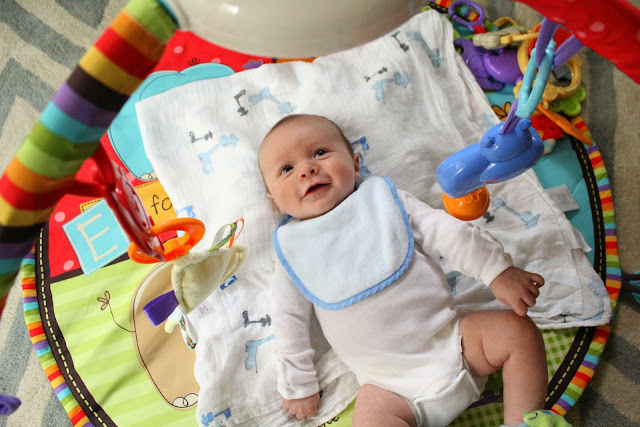 Love to see how much you're enjoying your little guy! Good luck with the house! Aww! So happy to see that everyone is doing well! I swear that is the cutest costume... Good luck with the sale of the house. I can't wait to see what the big man upstairs has in store for you! H certainly is a pretty awesome distraction!! So glad he is thriving and you are enjoying motherhood! It's such a huge life-changer but there is nothing better than that sweet smelling, warm little munchkin to wake up to, even if it's in the middle of the night! He's adorable Michelle! I am a sucker for chunky baby legs! He is so sweet, Michelle. :) And sounds like he's doing great at night too! so stinking cute Michelle!!! and look at you! You do NOT look like you just had a baby!!!!! cutest pea pod ever! he is so so so so cute! What a wonderful way to spend the day...snuggling with your little pea pod! Glad to hear he is doing so well, and you look fab out hiking with your baby boy! Thanks for sharing. He's such a cutie! And that pea pod costume is too adorable! I absolutely love it! Soo adorable!! Can't get over that how sweet that little smile is. What a cutie he is! That pea pod costume might just be the cutest thing ever! Smile so much. And the costume is killing me. Love it. I don't know how you get ANYTHING done at all....that baby is every shade of adorable! Wishing you good luck with the house sale. Aww, he is so precious! I love his pea pod costume! So adorable! And good luck with the house sale -- keeping my fingers crossed the perfect buyer comes along! Baby H is so sweet as a little pea pod! And you look awesome M!! Get it girl! Who can blame you, indeed?? What a cutey patootie! So glad you're enjoying him and your time at home. Of course, prayers for a speedy sale and smooth sailing into the holidays! Any chance you're going to Scott's this weekend with the ATL bloggers? Think I might finally make it!! Oh my goodness, what a doll! I love his smile (and the leg rolls, of course!) Best of luck with the house sale.